Please do not worry; the “missing” AED has not been used or stolen. It has yet to be installed, as we are awaiting activation of the security features. The AEDs purchased from the fundraising efforts of the Greenlee Foundation are in the schools and on the Board of Education fields. The others donated by our 5-Town initiative are in locations around town, where the selectman’s office, Westport EMS and Parks and Recreation felt would provide excellent benefits. We are looking to expand this initiative around the state, given the response we have had by all of the towns and our local politicians. In addition, we continue to work with the Board of Ed in each of the 5 towns to implement mandatory CPR certification and training to high school students as part of the PE and health curriculum, at no charge to the school budget. All of this is very exciting for us. We appreciate being able to give back, and hopefully save lives. When a Staples High School senior suffered cardiac arrest on the soccer field last fall — and was saved by the quick use of a portable defibrillator — alarms were raised. And they were not just the beeping of the device — also known as an AED. The Adam Greenlee Foundation — named for a Bedford Middle School student who was also saved by an AED — swung into action. They raised over $85,000, purchased 75 AEDs, and gave them to schools and organizations around town. You now see them nearly everywhere, from Wakeman Field to Compo Beach. Many others — donated by the Gudis Family Foundation and Norwalk Hospital (see above in red) — are placed around town, from Wakeman Field to Compo Beach. Another place was is Winslow Park. Earlier today, alert “06880” reader/Staples soccer player/dog walker Daniel Brill noticed that the dog park AED is missing from its case. One of 2 things happened. The AED might have had to be used. While unfortunate, that’s what it’s there for. However, we probably would have heard about it. If that’s the case, just put it back — no questions asked. And if you really want one of your own, just ask. I’m sure the Greenlee Foundation — and many others in town — would be happy to help. This entry was posted in Organizations, Places, technology and tagged AED, Greenlee Foundation, Winslow Park. Bookmark the permalink. I noticed this about a week ago but since it was the first time I had seen the case, thought the device hadn’t yet been delivered. I hate to think someone actually stole it. I was there today and noticed that it was empty and was wondering why! That is truly distressing! I hope the AED finds its way back. Hmm – I don’t think that’s a smart place to locate an expensive piece of medical equipment. Maybe an emergency telephone calling the 911 dispatch center might be a better idea. Is that case even designed to be placed out exposed to rain and the elements? 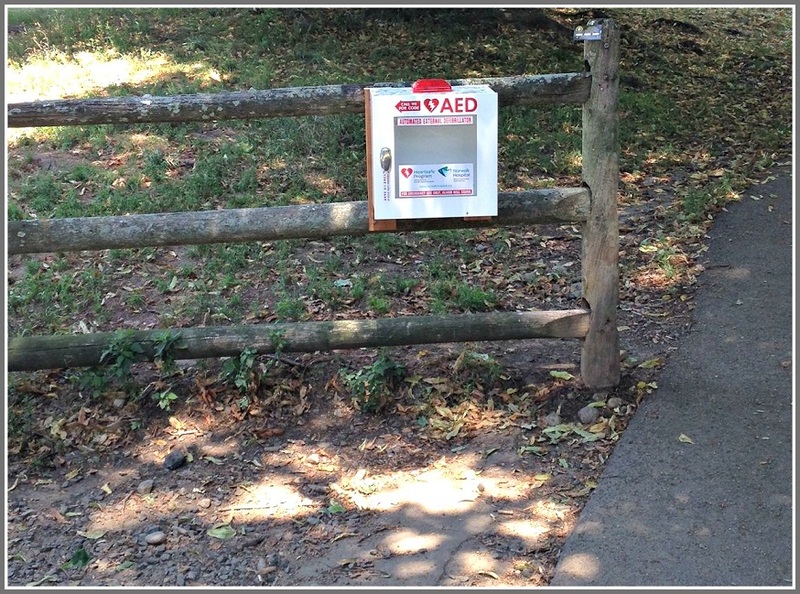 The AED at Winslow Park that you mention in today’s 06680 post was not used or stolen. It is one of the 100 AED’s donated by the Gudis family and Norwalk Hospital for placement in the communities of Westport, Weston, Wilton, New Canaan and Norwalk. In fact, if you look closely at the picture, it denotes the Norwalk Hospital – WCHN logo. This particular “missing” AED has yet to be installed, because the box has not had the security features activated, but no fear, as it will be there in the next few days. You should know that a vast majority of the others, including three at Compo Beach, Town Hall and numerous locations around Town, are installed and available to save a life—they are bilingual as well. These cases are designed for the elements and come with a padlock (they’re very secure). If you notice on the top-left of the box, it says “Call 911 for Code”. When you call 911, they will ask for the box’s location and then give you the code to unlock the AED. I personally don’t think that this was stolen, but most likely the box has not yet been stocked with an AED yet – as this is a fairly new program. If the AED was used, the Public would have most likely not heard about it and it will take time to re-stock. There is an identical AED box at Joey’s by the Shore at Compo, and many others in the tri-town area, with the same system and they work wonderfully. Please do not worry; the “missing” AED has not been used or stolen; it has yet to be installed, as we are awaiting activation of the security features. This particular AED is one of the 100 AED’s that the Gudis Family and Norwalk Hospital donated to the Towns of Westport, Weston, Wilton, New Canaan and Norwalk as part of their recent AED and CPR awareness initiative implemented after the Staples student incident last October. In fact, if you look closely at the picture, it has the Norwalk Hospital-WCHN logo on the case and a number to call if there is an issue. A vast majority of the others around Westport have been installed, including 3 at Compo Beach! So, please do not fear, the AED will be installed within the next few days and will be available to save lives–it is also bilingual. When the AED is used it is replaced by one on the emergency vehicle. The used AED goes to the hospital with the patient for the cardiac team to analyze. Unlike many other models, the AED’s donated by the Gudis Family-Norwalk Hospital (5) Town initiative have a new technology that allows the data captured on the AED to be easily transmitted/captured via the Town EMS software without needing to take the unit to the Hospital. However, often times, EMS crews will likely take them with the patient as a precaution and to save time. The AED outdoor cases are in fact weatherproof and were recommended by Norwalk Hospital and approved by Cardiac Science, the AED manufacturer. However, at extreme low temperatures, it is not advisable that these, or any AED, be left outside, and as such, will likely be retrieved by Town or Hospital EMS. Thank you so much to MaryGrace and Mark, your quick thinking already saved one life, and your generosity will save more. The Senior Center has had an AED for almost 10 years. It is one of the original 50 AEDs purchased in 2006 by the Town and managed by Westport EMS. These AED’s have been in every EMS, Police, and Fire response vehicle, in Town buildings including Town Hall, the Library, the Senior Center, and the Health District, and in every school. Thanks to the generosity of the Greenlee Foundation and Gudis family, there are now additional AED’s in each school, at the train stations, at virtually every organized playing field (both school associated and Town owned), and several at Longshore and Compo. The exterior cabinet (and yes, they are weather-proof) at Winslow Park was one of the last to be mounted, and will have the AED installed within the next week. Without question, Westport is one of the best AED covered towns in the state, if not the country.